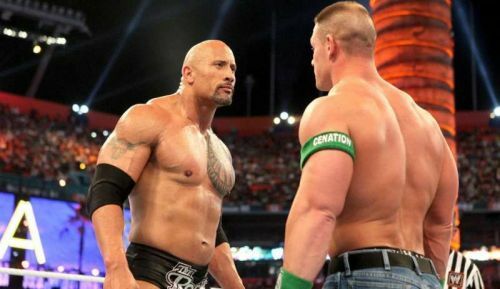 The WrestleMania is surely the most awaited, the most loved and the most watched PPV of the year. Fans wait for 'The Showcase of Immortals' and it is fair to say that the event in itself is a festival. Over the years, WWE has successfully delivered memorable moments at WrestleMania. Moments that are engraved in the memory of fans worldwide, moments that make this business so adored and the moments that we as fans have always wished for. Every year the WWE Creative brings together intriguing storylines and fascinating matches heading into the WrestleMania. While the new storylines and matchups do trigger the fans' imagination, sometimes a match is witnessed more than once and very rarely does it happen in two consecutive WrestleManias. Here we list down the six times when the same matchup (to be precise the opponents) happened during consecutive WrestleManias. Edge and Christian, The Dudley Boyz and The Hardy Boyz are three of the greatest tag teams of all time. Putting these three tremendous teams against each other is indeed a treat for the eyes and now that we realize that this triple threat match happened twice in a row at the WrestleMania 2000 and X-seven respectively, there is absolutely nothing else to do but applaud. The triple threat match first took place at WrestleMania 2000, when the three aforementioned teams fought in a Triangle Ladder Match for the Tag titles. Edge and Christian won the match and became the new Tag Team Champions. In the very next edition of WrestleMania, we saw these three teams colliding once more, yet again for the WWE Tag Team Championships, this time in a TLC match. Edge and Christian were victorious for another time as they left the arena with the tag team belts two years in a row. Interestingly, the Dudley Boyz were the reigning champions leading up to both the Manias but couldn't retain their championships on either occasion as Edge and Christian won the match or rather shall we say the matches. Despite witnessing the same match in consecutive WrestleManias, the WWE universe was in awe of what these teams were capable of and it is absolutely right to say that these six men enthralled the fans worldwide with their fantastic performance.